Ideally Dexter need a performance area of 5x3 metres. Although we are able to work with a minimum area of 4x2 metres if space is more limited. We perform in all types of venues ranging from Hotels manor houses, barns, marquees, ball rooms and intimate clubs so we do have the capability to make use of what space we are given. Please consider the following points when arranging the timings for the band performances. Dexter always make it their priority to work closely alongside the client to ensure the event is catered to their needs and we have going with the flow down to a fine art. It's important that things run smoothly and you get the best out of our service. So below is an example of how we might think the night may run best for you with booking band in mind. Although please note that these are just suggestions as essential this is your event/venues/big day and we absolutely cater for needs fully, even within a tight schedule. - Wedding performance example Booking from 7.30pm-12am with 2x 60 minutes sets. *Please be mindful when planning sets around the evening food. Ideally avoid having the band start at 8pm if the buffet is then ready to come out. Although again this is something in our experience the venue and band always work around. We are more than happy for you to highlight songs or a style from our repertoire that you would like to hear at your event and generally it's something we always accommodate, within reason. Ideally we do prefer if we are left to decide the set and order in which they are played when adding some of your choices as We always take into account how important it is to be versatile and cater to most if not all of your guests at some point during the night to ensure the dance floor is never empty. We travel Nationwide and even internationally. Due to the nature of our work, we don't play many public gigs as all of the events we perform at tend to be private parties. However, we do perform at an intimate music venue Granville's throughout the year which is fairly local to us in Stone, Staffordshire. We are very happy to learn up new material for your event. 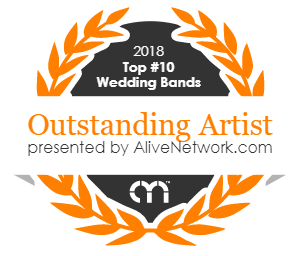 Weather it's for your first dance or a sentimental song or maybe you have a themed event and you want the band to also carry that theme on during their live set. Although this said it is all within reason and we do ask that at the time of booking us, please let your agent know if there’s a particular song you’d like us to consider learning so we have enough time to learn it well. Dexter are very much a live band! We are entertainers but we believe in giving you a true insight into our live performance energy and sound which we feel you can pick up on from our video. We want you to get a feel for the interaction and enjoyment your guests will have from having Dexter play at your event. We are born entertainers! We also accept informal enquiries via our Facebook page (www.facebook.com/dextertheband), where we will be happy to talk through your event in person. Are you able to DJ in between sets and make requests? We offer a FREE DJ service with your booking carry a laptop with over 5000 songs to all our gigs that we use specifically for DJ'ing, making sure that we keep the dance floor swinging in between our live sets. We are happy to take requests for DJ songs. Music playlists between sets comes as standard with every booking, bit if do you want a more bespoke DJ service, we do ask you to put together a playlist and email it to us prior to your event. Any requests for the DJ service will only be possible if we already own the music you require. We do not purchase music for clients due to the costs this can incur. Dependant on timings if the band are already set up you are welcome to use our PA system for your speeches. However, we do ask that you inform us before the event and get permission from the band members before hand. This is something that can be discussed when booking the band through the agency ultimately we cater to your needs and this will be allocated into your fee when booking our act. We offer lots of different options 2 x 45 mins 2 x 50mins 3 x 50mins 2 x 1hr slots etc. We also have the facility to offer you an intimate acoustic set during the wedding breakfast and it has been know fornusbto play during the church service. Please speak to our agent if this is something that would interest you. We usually start our first set at around 8.30/9am and play our second set in the final hour or so of the evening, but again we are totally flexible with this. Arrival and finish times are 6pm and midnight as standard with early arrival and late finish fees applicable outside of these timings. We usually dress formally for most parties Male Member would wear trousers, shirt and tie) female LBD unless informal attire is requested. In the past, we’ve also been asked to join in with an events theme, DEXTER LOVE TO DRESS UP so please let us know. Why should I book Dexter? Dexter are one of the only bands on the agency to offer you both Male and Female lead vocals! and aside from this the only band on the agency that you can book that offer 4 different acts/shows. Dexter can also perform as the ultimate tribute to the 1980's. If you want to have your event transported back to the 80’s with smash hits from Soft Cell, Madonna, Duran Duran & authentic 80’s clothing and costumes, visit Alive & Kicking's profile now for more information! What about the swinging 60's? Dexter can also bring to life, the sounds & memories from the wonderful 60's. If you want authentic 60's instruments & costumes, with classic tracks from The Supremes, The Beatles & more; visit So 60's profile now for more information! This alone make us one of the most Versatile acts with an extensive/ powerful repertoire. Dexter has entertained audiences at venues from marquee weddings and stately homes to thousands of people at open-air concert venues. We are equally at home providing the live entertainment for a wedding or birthday party as they are playing for major corporations or university balls. The five members of Dexter have many years of live performance under their belts. Members of the band have performed in venues such as the London Palladium and the Marquee Club in London and all members have numerous recording credits to their name. Dexter has also shared the bill with artists including Jools Holland and his Orchestra Catatonia the Honeyz and Coolio. The set contains rock and pop classics from the 60s to the present day packed with guaranteed floor fillers and sing-along favourites. Material has been carefully selected to provide not just the best in more 'established' songs by acts such as Robbie Williams and ABBA but also more energetic tunes from the likes of Plan B Jess Glyne and the Killers. Whatever the song, the attention to detail is outstanding. Multi-part guitar and vocal arrangements, as well as state-of-the-art equipment, bring the set to life in a way few other bands can match. So who trusts Dexter with helping to make sure that their event is memorable? Prices vary slightly based on the time of year, the location of your event, timings, and any upgrade options, but our standard price starts at £aaa including VAT. Do Dexter have any specific requirements? We always make sure that our volume levels are such that people at your event can still converse, but really feel as though they are at a gig when they're on the dance floor. Being a 5 piece rock and pop function band, the nature of the music we play means that we can only turn down so far! If your chosen venue has a DB limiter, please discuss this with your agent at the time of your enquiry - There’s every chance that we (or one of our fellow agency bands) have performed at the venue before, but if not, it’s worth discussing to make sure that the performance you will receive from us will not be compromised. However, if your venues decibel limit is restrictively low, we consider bringing our electric drum kit version of our performance which will help with the noise level by compressing the amount of Volume on stage. We usually request 2 double 13 amp supplies near to the stage area. We use LED lighting which keeps our power consumption down but we prefer to run lights from one power source and audio equipment from another to reduce the risk of noise interfer-ence. As a rule, we draw approximately 16 amps with everything on and have only ever experienced any issues in events in marquees where the generator capacity has been too low. Do Dexter offer any additional services? As previously mentioned Dexter offer a number of additional services at very competitive rates: From ceremony music, acoustic sets during dinner, additional/extended DJ service to live song requests. If you would like more information regarding the above options please contact the agent or email to discuss.